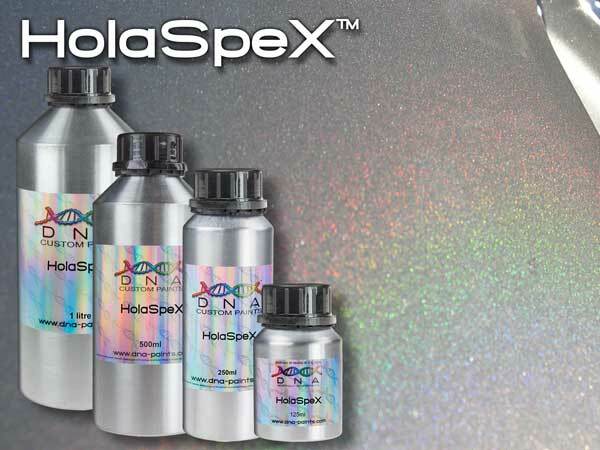 HolaSpeX™ an almost transparent coating saturated with light refracting holographic crystals. In direct sunlight or under strong light these immediately refract an immensely strong holographic rainbow effect. HolaSpeX™ is “in your face” Similar effect to HolaGrafiX™ but with a larger crystal. Can be applied over any color ground coat you like however for the strongest effect darker ground coats produce a more intense effect. Available in 3 handy sizes. In these kits you get all of the DNA™ products you need to achieve an amazing HolaSpex™ effect! If you want a kit please make your selection via the dropdown box below. Pure Black BaZecoat™ or alternate color of choice, 2K Diamond Clear™, HolaSpeX™ & Key Clear. See TDS for all details. 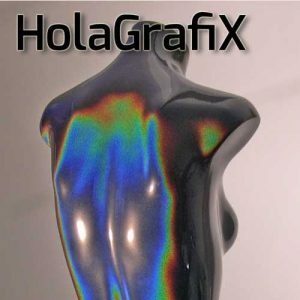 HolaSpeX™ is designed to be used over a ground coat color of your choice. However for maximum color effect apply over DNA™ “Pure Black” BaZecoat™ (# B113). For a different or more subtle effect you can choose a different color ground coat. Key Clear™ must be used to seal and lock HolaSpeX™ into place before final high gloss 2K clear coat is applied.